bow drawn, arrow nocked and ready to fire. 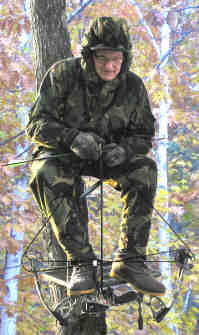 Little movement is necessary to dispatch the arrow, so the deer are not spooked. The Bow Rest takes the weight of the bow and archer's arm and steadies the bow while aiming and firing. It does a better job than the shooting stick for steadying the bow. The Compound Bow Rest and Holder allows aiming over a wide area. The boom swivels about 180 degrees for horizontal aiming. 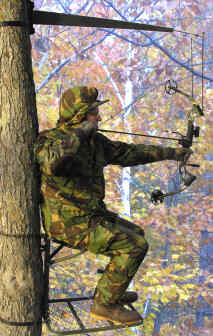 Limited flexibility of the ratchet straps holding the unit to the tree along with body movement allows vertical aiming from about 10 yards to infinity. The body movement referred to means crouching slightly while sitting to rising from the seated position to varying degrees. If game is outside the aiming area the bow silently removes from the Compound Bow Rest and Holder simply by lifting, allowing the hunter to shoot even directly below. The question asked most often is "Will it fit my bow?" Because of the great variety of bows available it is not possible to say unequivocally that it will fit your bow, but I have not seen one yet that I could not use with the Compound Bow Rest and Holder unless it is the one where the riser is all handle. If your bows upper limb pocket looks like this you will be able to use the generic bow holder supplied. Even if the bow pocket is not centered on the riser the generic bow holder should work. Many older bows have unsymmetrical bow pockets that will require you to reshape the generic bow holder, or to bend a new one with the extra coated wire that comes with the Compound Bow Rest and Holder. As long as both sides of the limb pocket stick out a little from the riser so that the bow holder has something on each side of the bow pocket to engage, you should have no trouble bending a workable bow holder. The following bow is my 1994 vintage Bear bow and the bow holder I bent to hold it securely but come out readily by lifting the bow. With some bows, however, the riser goes straight up from the riser to the upper limb pocket such that there is no projection on one side to engage the bow holder. In this case you can build a small "shelf" on that side to engage the bow holder by gluing a small piece of wood, plastic, or metal to the side of the bow. A friend's bow was of this type. The pictures show the riser and the little "shelf" he made with epoxy cement. The shelf is circled in the second picture to accentuate it. A number of Mathew's bows have no limb pockets. In these bows there is a small hole about 3/16" in diameter just below the upper limb. A threaded rod cut from a machine screw about an inch longer than the width of the riser inserted into this hole and held with a couple of washers and nuts would make a fine spot for the bow holder to hold the bow. Unless your bow is a radically different in design from the usual compound bow, with a little ingenuity you should be able to use it with the Compound Bow Rest and Holder. If you have problems, contact me. Perhaps I can help. 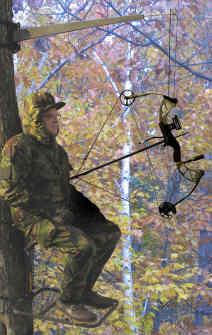 The Lock-a-Draw equipped bow can be drawn between hands and feet in a tree stand, so the foot stirrup can be replaced with the stabilizer for hunting.